1st District Representative Hon. 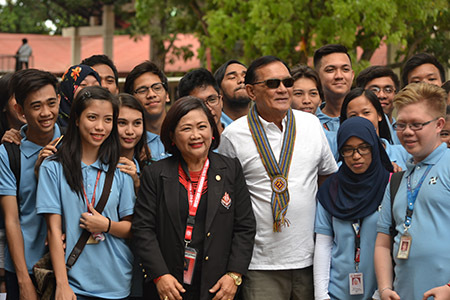 Celso L. Lobregat and WMSU President Dr. Milabel Enriquez Ho with DOST student-scholars. 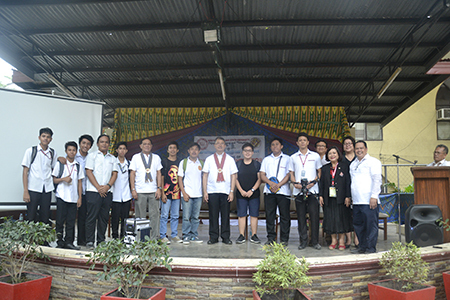 CET Dean Dr. Roberto M. Sala with DOST Secretary Fortunato Dela Peña. The event was kicked-off with a blessing of the innovation center. WMSU officials and honored guests with winners during the CET Expo 2017. The WMSU College of Engineering and Technology (CET) took a big leap as the Innovation Center for Metals and Engineering was launched February 16, 2017, with Department of Science and Technology (DOST) Secretary Hon. Fortunato Dela Peña and Undersecretary for Regional Operations Brenda L. Nazareth-Manzano, and District 1 Representative Hon. 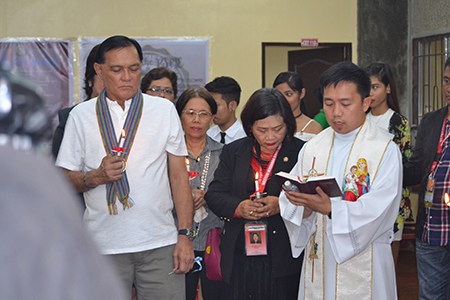 Celso L. Lobregat as guests of honor. The Innovation Center houses the various equipment donated by DOST. The delivered equipment funded by DOST amounting to P4.8 million are the following: mini steam boiler with turbine, bench lathe machine, drilling machine, various measuring tools,	welding equipment, and plumbing devices. Several equipment amounting to P2.4 million are still to be delivered like the three-dimensional printer, refrigeration and air conditioning cleaners, and CNC lead machine. This innovation hub was the brainchild of CET Dean Dr. Roberto M. Sala and then DOST-IX Regional Director, now Undersecretary for Regional Operations, USec. Brenda L. Nazareth-Manzano. This project was approved late 2013 and the first tranche out of the total amount of the budget was released immediately for the procurement of necessary equipment after the project fund turnover ceremony in August 2014. The construction of the facility began in 2015. DOST Secretary Fortunato T. Dela Peña encouraged CET to put this project into good use. The Innovation Center can be an enterprising service through metals and engineering innovations that will assist small and medium enterprises, new businesses as well as individuals. “Through this, your college can generate income to further improve your researches and provide assistance to the researchers, too”, said the secretary. He also recommended to bridge together technology and creative arts to be able to produce aesthetically beautiful outputs. Sec. 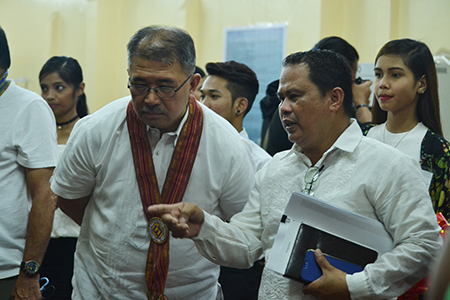 Dela Peña urged the University to introduce students to the world of entrepreneurship. “Coordinate with DOST Region IX for the adaptation of the project “DOST Academe Technology-based Enterprise Development”, he told WMSU. It is one of the project of DOST whose beneficiaries are students who want to put up technology-based businesses. They will be given assistance in putting up their own enterprise at least a year or two before graduation. They just have to have an actual product and they will be given money as their capital. The Secretary also mentioned that the students must be informed about their rights in terms of protecting their Intellectual Property, such as patents, utility models and industrial designs. “DOST can extend assistance in conducting trainings so you can accumulate intellectual property registrations,” said Sec. Dela Peña. The honorable secretary also urged the University to “incubate” on the researches conducted by the students and the faculty. “When students innovate and invent, it is important that the university will “incubate” these technology innovations so as to welcome business opportunities from outside,” he said. Lastly, he encouraged the faculty members to apply for a graduate scholarship with DOST which gives P20,000.00 for a master’s degree and P30,000.00 for a doctorate degree. Dean Sala thanked DOST for trusting WMSU’s capability to be the hub of technology innovation in Mindanao. “It broadened our exposure and motivated the students to engage in researches in the field of metal engineering, this will also be of great help to the community,” Dr. Sala said. “We look forward to future investments with other stakeholders, so we can also bring income to the university,” the dean added. On the other hand, WMSU President Dr. Milabel Enriquez Ho acknowledged the initiatives and dynamism of the CET dean. She also challenged the faculty and students of CET to give their best efforts in doing their future projects. Also, First District Representative Hon. Celso L. Lobregat guaranteed that he supports WMSU’s future endeavors and also gave incentives to the winners of the CET Expo held last February 13, 2017.